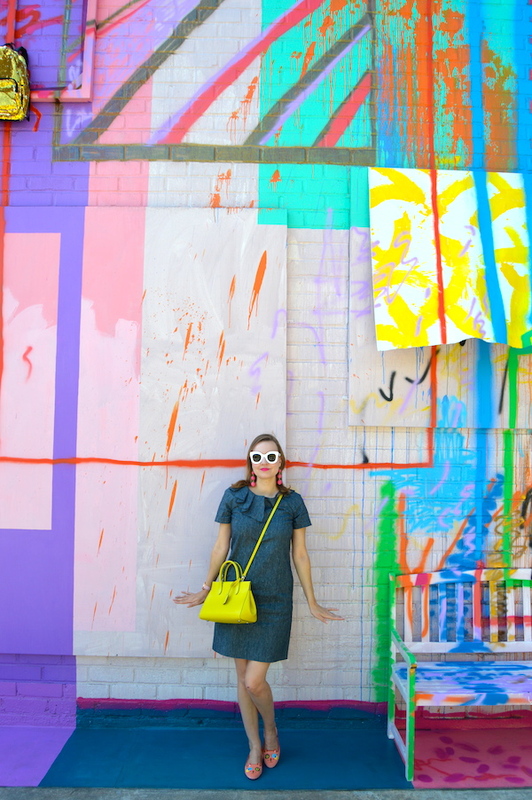 As you know, I am always on the lookout for fun and colorful walls in the Los Angeles area or wherever my travels happen to take me. Well, there's a new wall in town and I couldn't be more excited! This new wall is located at the Institute of Contemporary Art, which is a new museum that just popped up in Los Angeles' Downtown Arts District. I think my favorite thing about the wall is that it's not just a wall, as it also has a colorful bench that is painted to match the wall. Luckily, the paint on the bench didn't come off on my dress or bag! 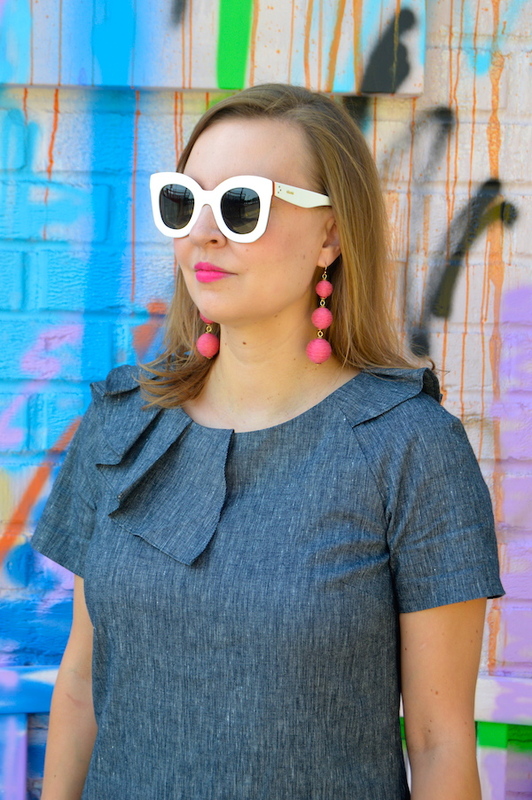 Speaking of my dress, in this post I am debuting my new denim dress from Banana Republic. It's not really new, though, as I actually bought it over the summer but this is my first time wearing it. While it's no longer available online, below you will find some other versatile denim dress options that are perfect for fall or perfect for sitting next to a very colorful wall! On a final note, I think these Abstract Kitty flats from Charlotte Olympia might be my favorite shoes ever! Although they were a bit of a splurge, they were totally worth it! My husband always pokes fun at both the shoes and their price tag whenever I wear them, but clearly they are fabulous. My only regret is not getting them in the two other colors they came in. 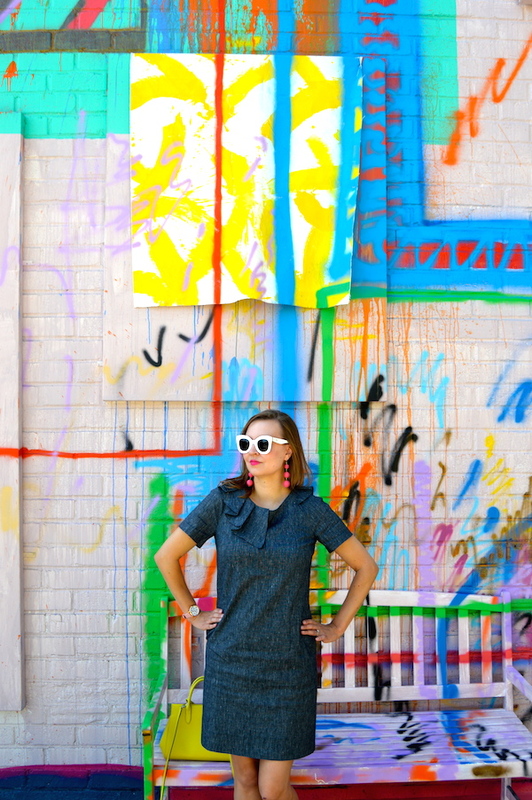 They turned out to be the perfect accessory for this wall and for walking around the Arts District in Los Angeles! That's a beautiful denim dress! It would be perfect for work, which is something I've never thought of trying before, wearing a denim dress to the office. Oh my goodness how cute are you!!? 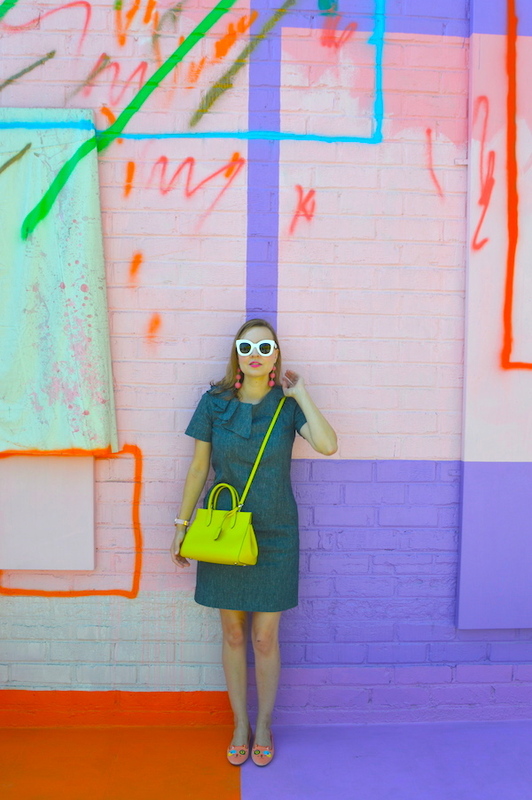 I absolutely love this colorful wall and your whole look is perfection! Need those cat flats in my life! Thanks for sharing! I love that wall! All the textures are amazing! And I have to say that those flats are the cutest I've ever seen! Nice wall! You find the best shoes too, so cute! Love the dress and the ruffle detail on you Katie!